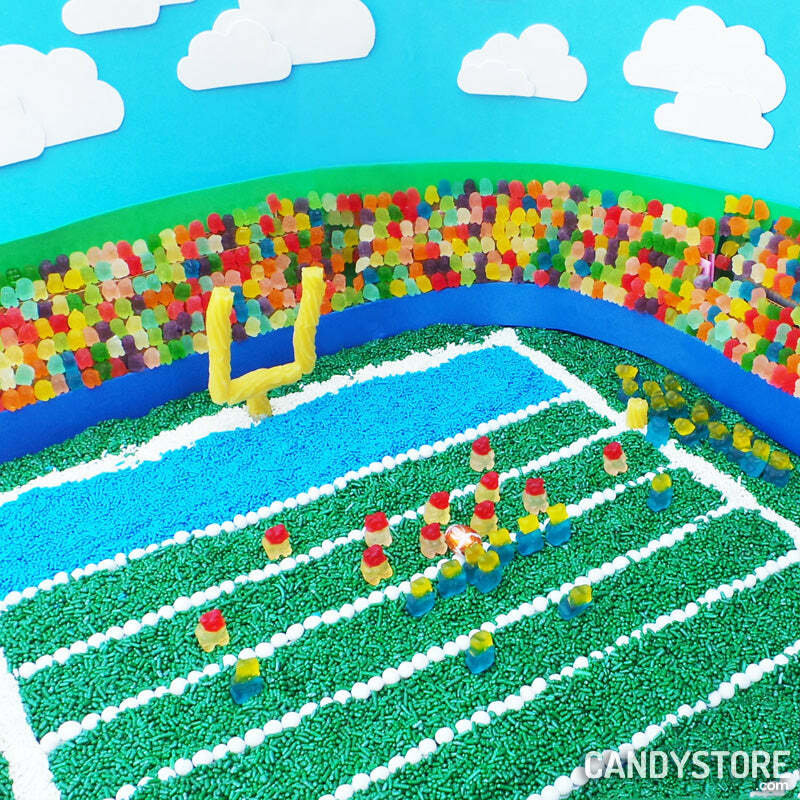 We are big college football fans here at CandyStore.com. Apparently it’s rubbing off on the candy too. You’re looking live from Austin, Texas as the Fighting Irish make their last gasp 4th quarter drive to try and win the game. It’s 3rd down and 1 from the 9 yard line. 0:55 remains. The score is 27-21. The Longhorns have the lead. 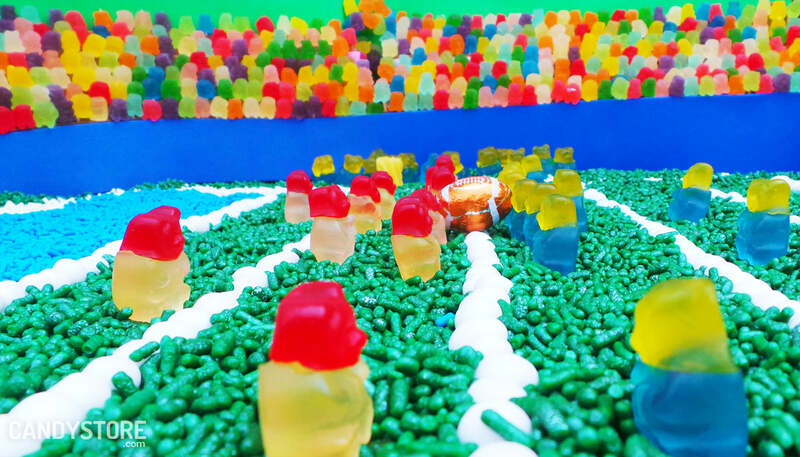 This is gummy bears football at it’s best. Notre Dame Head Gummy Bear Brian Kelly doesn’t look like he’s set up for short yardage though..
….Incomplete to ND WR Torii Hunter. Broken up by Kris Boyd in the endzone. 4th down and 1 now. 0:49 remains. Now Coach Kelly, wearing all blue today, has them in a short yardage formation. 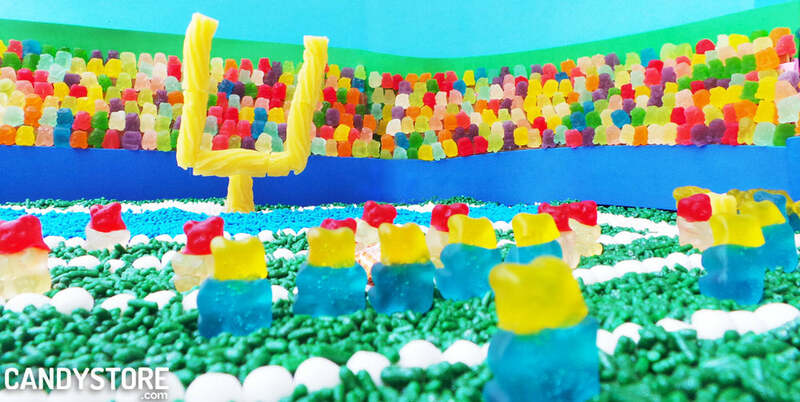 He’s keeping a close eye from the sideline. 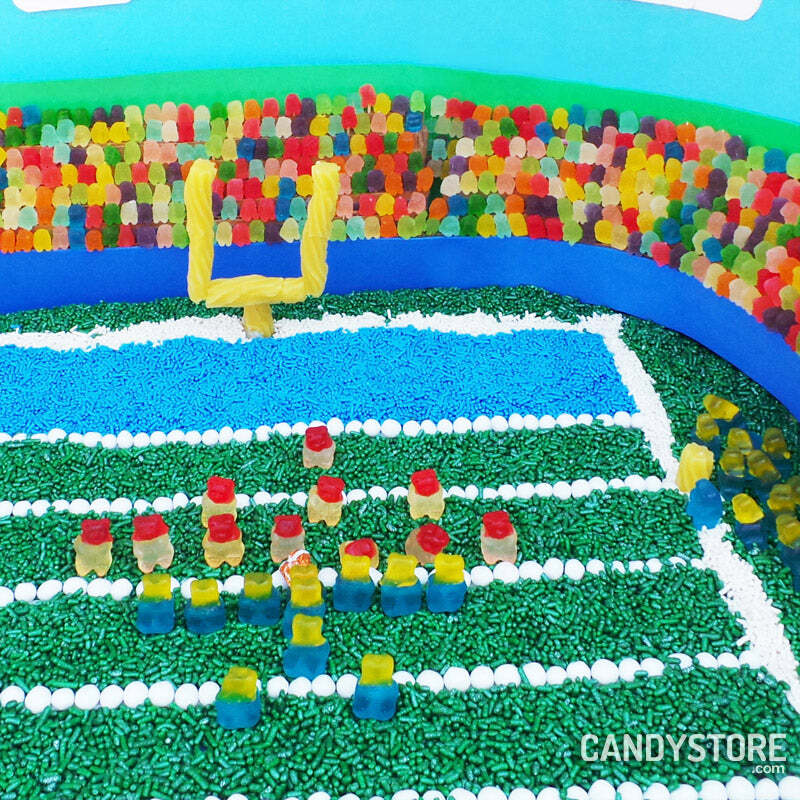 The play goes off just as the gummy play clock expires (and maybe a half second after!). They get it, and then some! The Irish advance to the 1 yard line on a keeper by QB Gummy Malik Zaire. But with no timeouts, the clock is running. 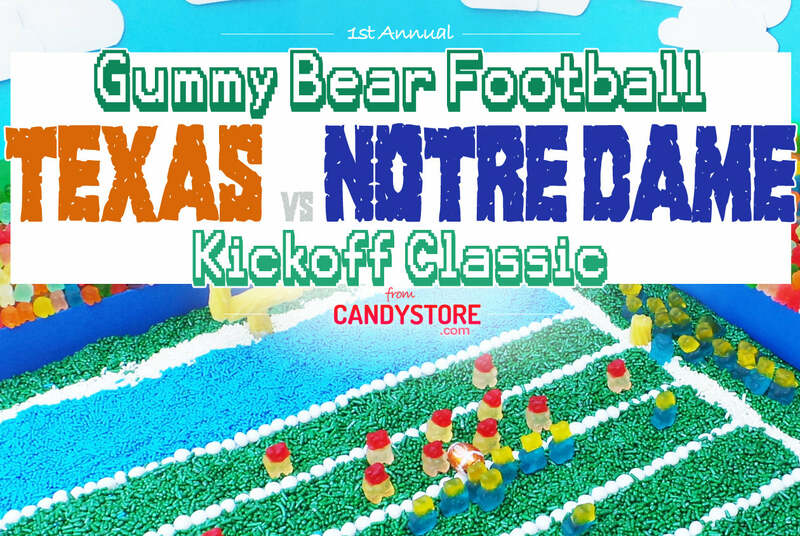 0:20 remain as ND’s gummy bear troops line up in another short yardage formation. “Is that wise given the time remaining” says the announcer. ND fans roll their eyes. It’s uncertain whether the eyerolls are aimed at the announcers comments or at Coach Kelly’s red zone decision. Texas fans lick their candy chops. Texas Coach Charlie Strong looks confident, steely eyed and ready to eat that delicious chocolate football. One stop here and it could be over. 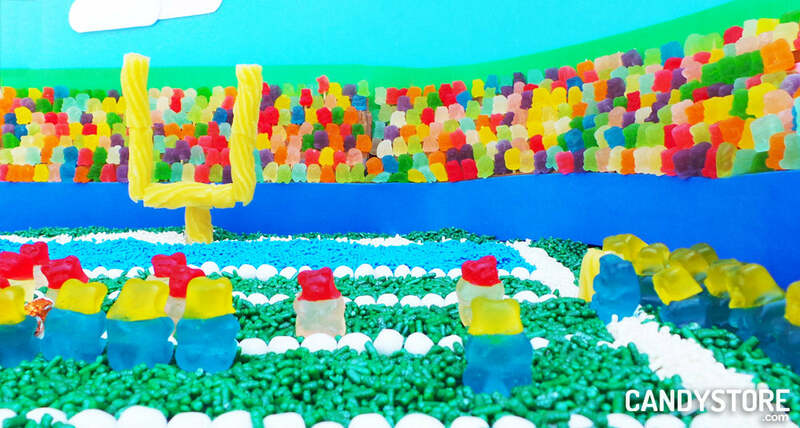 Gummy bear mini fans are on the edge of their seats. 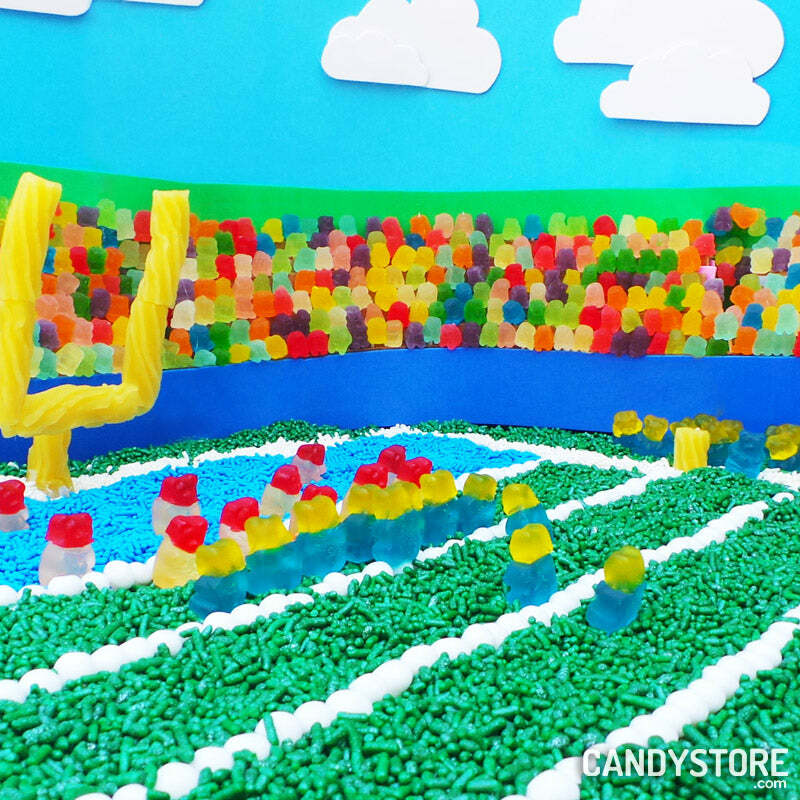 The teams line up for the big play. The snap goes up… RB Tarean Folston gets the handoff, it looks like he’s in. No, wait! Now only 0:07 remain. Likely time for only one last play. ND fans can hardly look. Texas fans can taste the Victory. The Irish line up under center. It’s DeShone Kizer at QB now. “I think this is the first time he’s been under center today, Al” one commentator says. ND fans were thinking the same thing. Oh no, not now. Texas fans too. Yes, please screw up the snap! Coach Kelly looks to be changing the play. He doesn’t like the defense Texas coach Strong is showing. Fans heads are on a swivel between Kelly, QB Kizer and the play clock. It’s down to 0:05 now. The Irish can’t afford another penalty here. Kizer drops back into shotgun. WRs Hunter, and Holmes wide to the left. Boyd is out there in coverage. Kizer barely has time to survey the defense before calling for the snap. The final play begins just in time. BLITZ! Texas is coming in hard. DE Nashan Hughes looks to have a clear path straight to the QB. 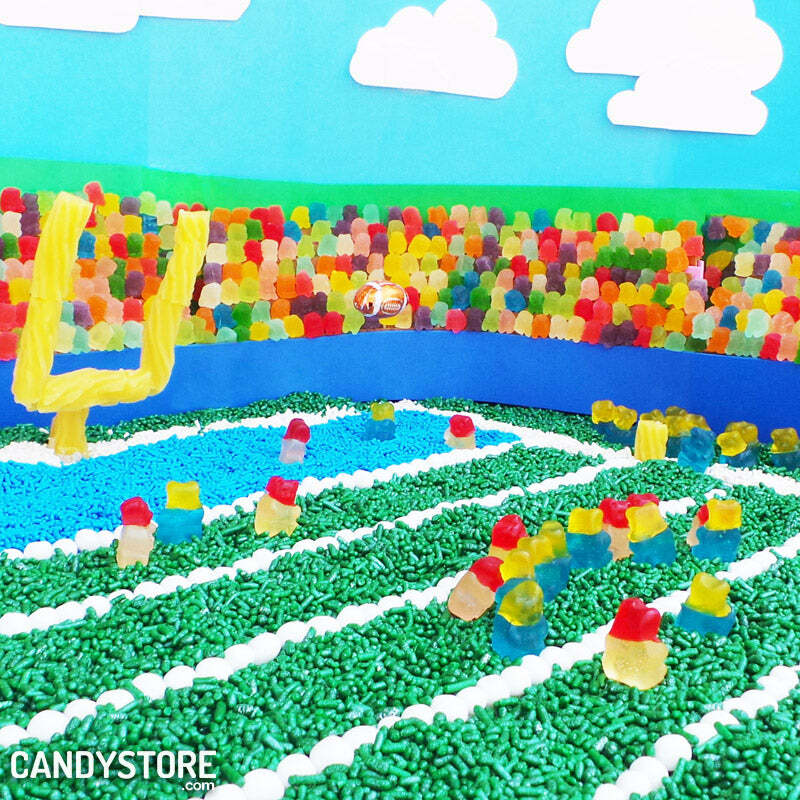 ND’s Kizer lofts a final pass to the corner of the yummy blue sprinkles endzone just in time before getting leveled! He’s got it!! ND Fans explode in the stands and at home! With 0:00 on the clock, the Irish score! BUT, the score is now tied. 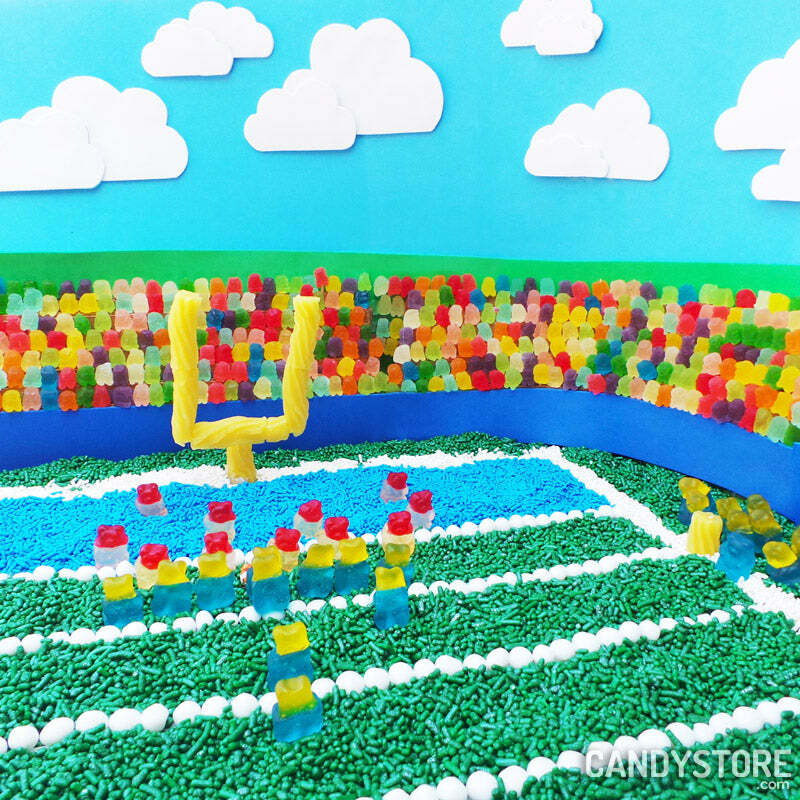 The extra point will decide whether ND completes an amazing 4th quarter candy comeback or it goes to overtime here in Texas Stadium. ND Kicker Justin Yoon is back for the all-important kick. The Irish win the first major battle of the college football season. The Irish players are piling up on the field! 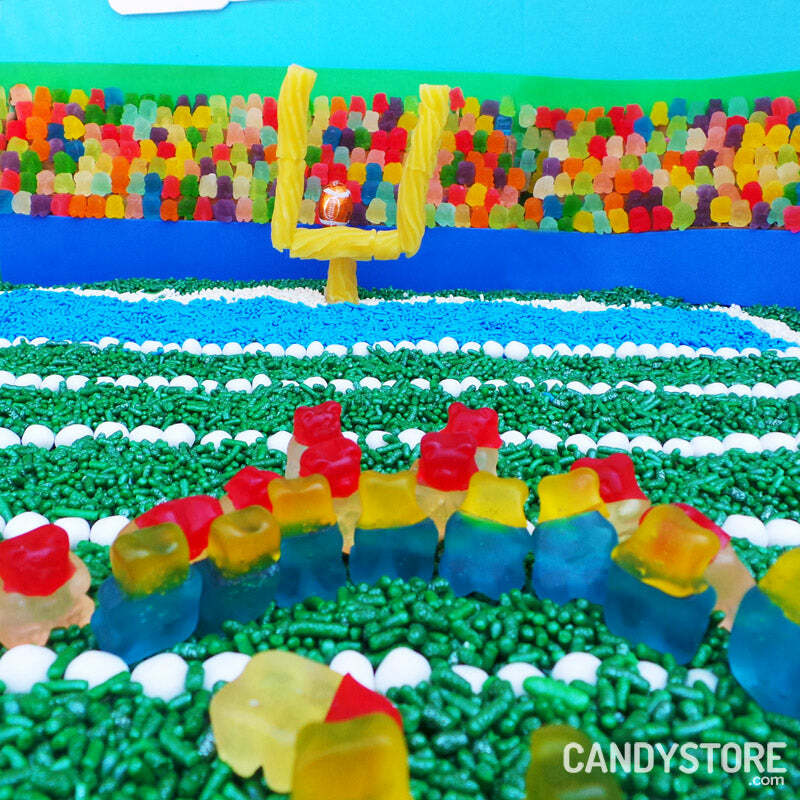 Coach Kelly and the Notre Dame gummy bears football team look very excited! What a great start to an exciting 2016 College Football season! … For ND anyway. Sorry, Texas fans. We have no bias here, just letting the gummies fall where they may. Who do you think will be the big winner in 2016? 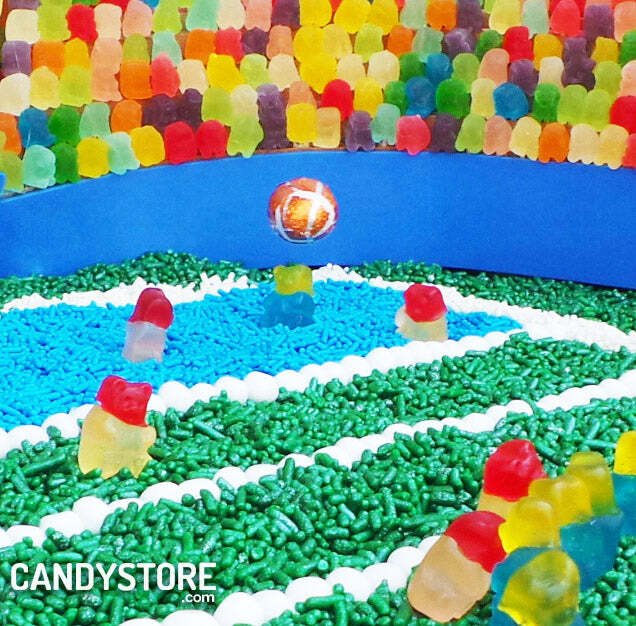 Hit us up #GummyFootball. 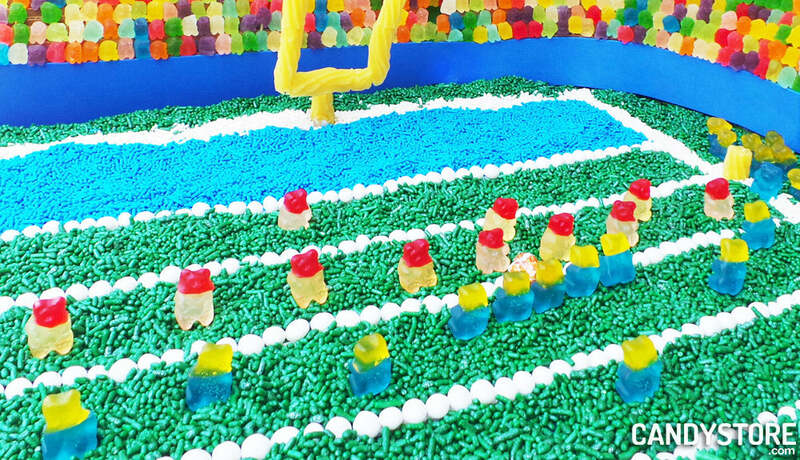 Love gummy bears? 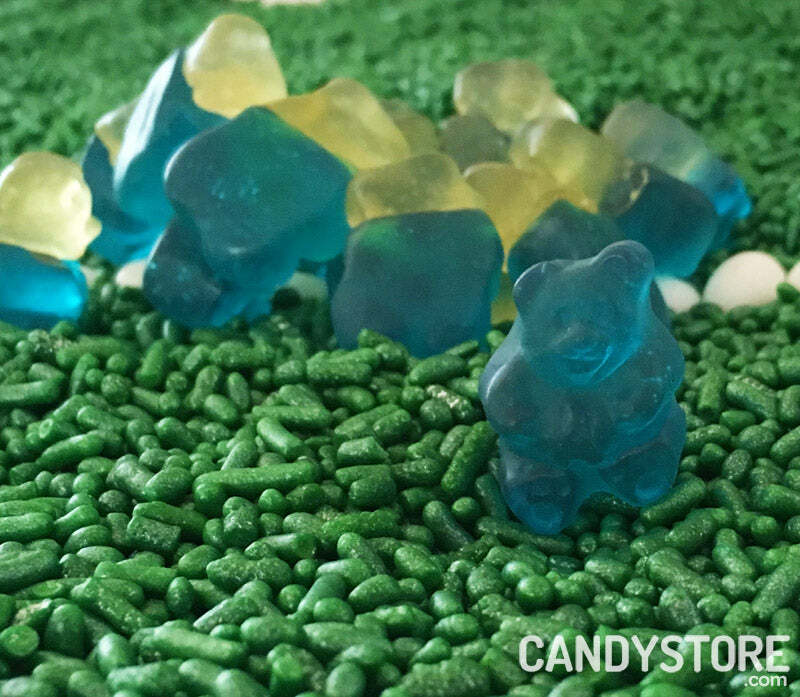 We wrote the Ultimate Gummy Bears Guide – History, How They’re Made, How You Can Make Them Yourself, and Other Fun Treats you can make with them. 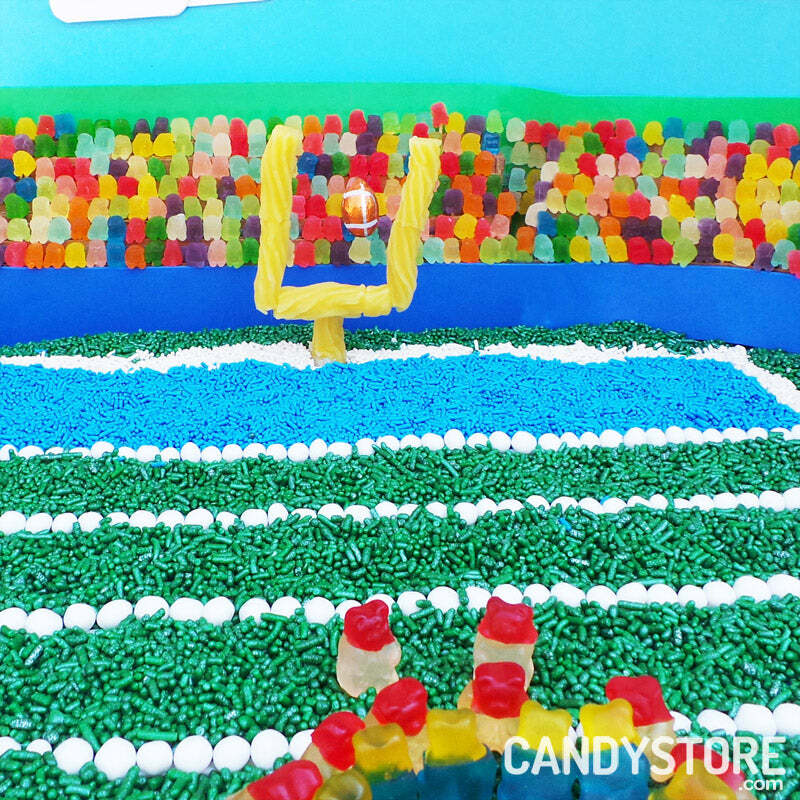 How do I get these Notre Dame gummy bears?